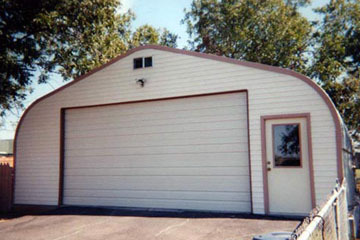 Steel Arch Buildings' A-Model metal building has revolutionized the way people think about the backyard shop. The A-Model ranges from 16 feet wide to 30 feet wide and can continue in length until you run out of space. For over 35 years, Steel Arch Buildings' unique metal building design with its straight sidewalls & pitch-style roof, surprisingly roomy interior, flexibility and ease of assembly keeps people coming to Steel Arch Buildings every day for their building needs. Engineered to withstand the harshest environments, our arch metal buildings deliver the strongest, most flexible, clear-span protective metal buildings money can buy. Our metal buildings are Hurricane Rated & Snow Load approved! Visit our A Model Steel Arch Building Gallery for more images of our A model metal buildings. You won’t find a more durable, cost-effective solution for your steel building needs anywhere but U.S. Buildings. Give us a call toll-free at 800-222-6335 and one of our trained consultants will assist you in choosing the perfect building for your needs.